I’ve published several links to global maps of coastal hypoxia. Now, NASA has produced a new map of global hypoxic zones, based on Diaz and Rosenberg’s . Spreading Dead Zones and Consequences for Marine Ecosystems. in Science, 321(5891), 926-929. NASA’s EOS Image of the Day writes on Aquatic Dead Zones. Red circles on this map show the location and size of many of our planet’s dead zones. 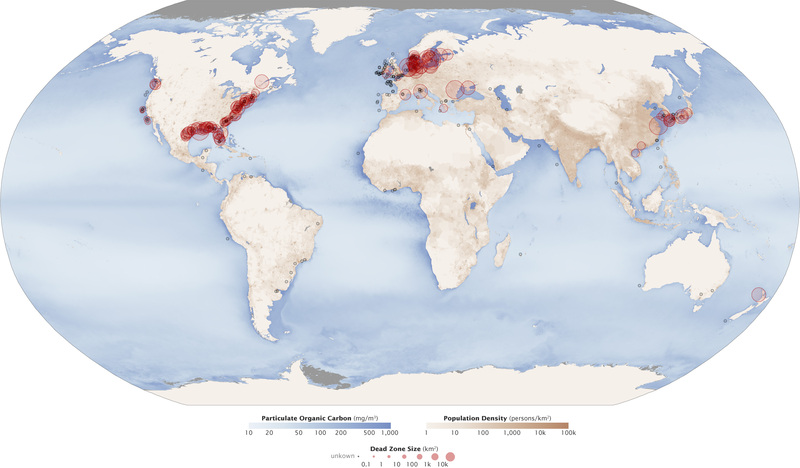 Black dots show where dead zones have been observed, but their size is unknown. There has been a lot of news coverage of the large coastal algal bloom at China’s Olympic sailing site in Qingdao. The Chinese government claims the bloom is now under control. 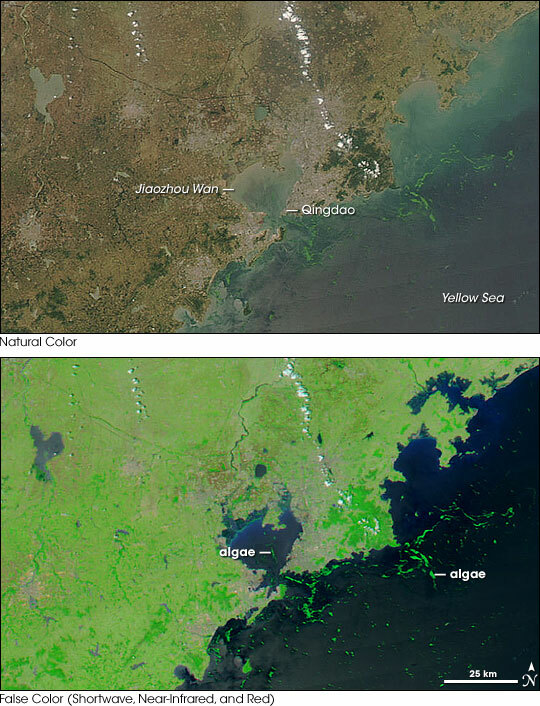 On June 28, 2008, the Moderate Resolution Imaging Spectroradiometer (MODIS) on NASA’s Aqua satellite captured these images of Qingdao and the bay of Jiaozhou Wan. The top image is a natural-color image similar to what a digital camera would photograph. The bottom image is a false-color image made from a combination of light visible to human eyes and infrared light our eyes cannot see. In this image, vegetation appears vibrant green, including the strips of algae floating in the bay and in the nearby coastal waters. Eugene Turner, Nancy Rabalais, and Dubravko Justic‘s recent article Gulf of Mexico Hypoxia: Alternate States and a Legacy (Env. Sci. Tech., 2008 42(7) 2323–2327) suggests that benthic carbon in the coastal benthic may be a critical slow variable regulating coastal hypoxia. As organic matter accumulates in sediments it demands increasing amounts of oxygen, making the area more vulnerable to nutrient driven hypoxia. … there has been a system-wide response to the combination of organic buildup in the sediments and higher nitrogen loading, which has increased the area of hypoxia generated for a given nitrogen load and has increased the opportunity for hypoxia to develop. The results discussed above demonstrate that the average [nitrogen] loading of the 1980s would result in a hypoxic zone that is twice as large in the past decade. …Hypoxia has well-documented catastrophic consequences to the benthos, including animals with multiyear life spans, and creates large areas without commercial quantities of shrimp and fish. The changes in the Mississippi River-influenced continental shelf over the last 30–40 years should be considered to a shift to an alternate state in the sense that (A) the threshold for hypoxia development has been exceeded on a continuing basis and the size of the hypoxic zone has increased and may be approaching its maximum size, given physical constraints on shelf geometry (e.g., width, depth, and length); and (B) the return to a previous system state is more difficult the longer that the current level of nutrient loading is stable or increasing. … respiratory demand in the sediments remains a legacy influencing water quality of the eutrophied continental shelf in the northern Gulf of Mexico. …The goal of reducing the size of the hypoxic zone to 5000 km2 thus becomes more difficult to achieve for every year without a significant reduction in nutrient loading. Each year without reducing the nutrient loading rates means that it will take longer to realize the Action Plan goal, because the legacy of accumulated organic matter and its respiratory demand increases with time.